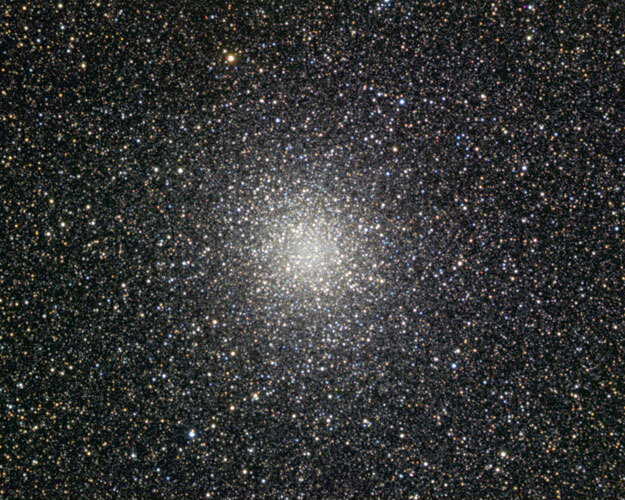 M22 is the third-brightest and third-largest globular cluster in the sky, after Omega Centauri and 47 Tucanae. It was probably the first globular discovered, in 1665 by Abraham Ihle. It is one of the nearest globular clusters at a distance of 10,400 light-years. Technical Notes: Individual exposures were obtained using CCDAutoPilot2 and then sigma combined. The RGB image was created in Registar 1.0. Russell Croman's GradientXTerminator plug-in for Photoshop was used to remove mild light pollution gradients.